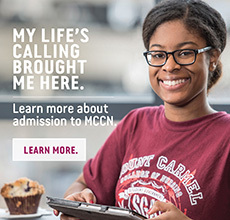 Share your plans or future goals after you graduate from MCCN. Elaborate on characteristics you see in an excellent health care professional. What is the greatest risk you have taken and what did you learn as a result of it? † Some students experience personal or professional hardships or other extenuating circumstances which negatively impact academic performance. If you choose to do so, you may submit a 150 word or less essay that addresses any downtrends or drops in your academic history. * TOEFL is required for All applicants whose native language is not English are required to take and submit scores for the Test of English as a Foreign Language (TOEFL). The required score is 79 for internet-based, 213 on computer-based and 550 on paper-based. TOEFL scores are valid two (2) years from the test date. To learn more about the TOEFL, please visit www.ets.org/toefl. **Transfer or Advanced Placement applicants who have taken course work or earned a degree abroad are required to have foreign credit evaluated by one of the following Credential Evaluation Services. *** Prospective students who have not completed high school are required to submit documentation that they have earned their GED. Please note that MCCN requires that students with a GED must successfully complete the required college preparatory course work with a grade of “C” or better. These courses can be taken at the college level.